Two talented composers of ambient-atmospheric soundscapes, Shane Morris & Mystified, have joined forces to create Epoch, the first installment of a trilogy about prehistoric time and evolution. Epoch is a conceptual album of deep, resonant, atmospheric drone soundscapes based around life during the Mesozoic era of Earth’s past; a time long before people, when great reptiles walked the planet, prospered, and ultimately ceased to exist. “The album uses a heavy emphasis on winds and bass percussion instruments to create a sonic environment that might reflect some of the sounds that occurred 200 million years ago.” adds Morris, and while the instrumentation for Epoch is indeed limited to all acoustic instruments, including trombone, didjeridoo, vibraphone, bass drums, scissors, and assorted percussion, these sources were then processed heavily with electronics into the primeval sonic environments heard on the album. 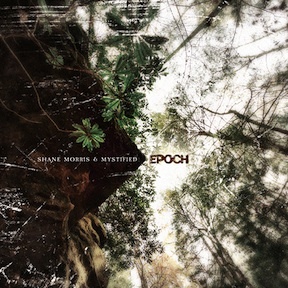 Throughout Epoch, Shane Morris & Mystified guide the listener through remarkably vast and wonderfully organic soundworlds that unfold in chronological order, where each track acts as a sonic portal offering glimpses into the distant past, and illustrating the gradual persistence of evolution itself.